Launching and recovering the Bluefin Wrangler was almost a pleasure, which is saying something for the Deepwater Point ramp. Most of the reason was the Dunbier Glidon trailer. It did not lay on a glide, but it was pretty slippery. 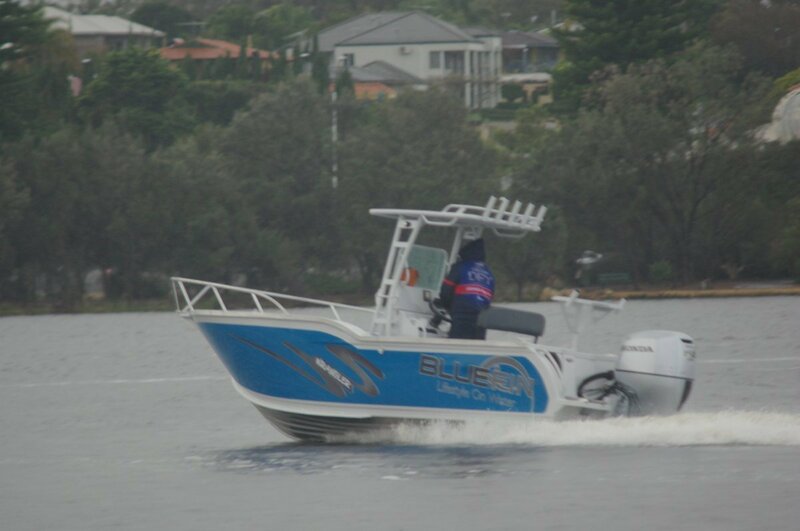 It was also rated for 2,000kg, usefully above the loaded weight of the boat. 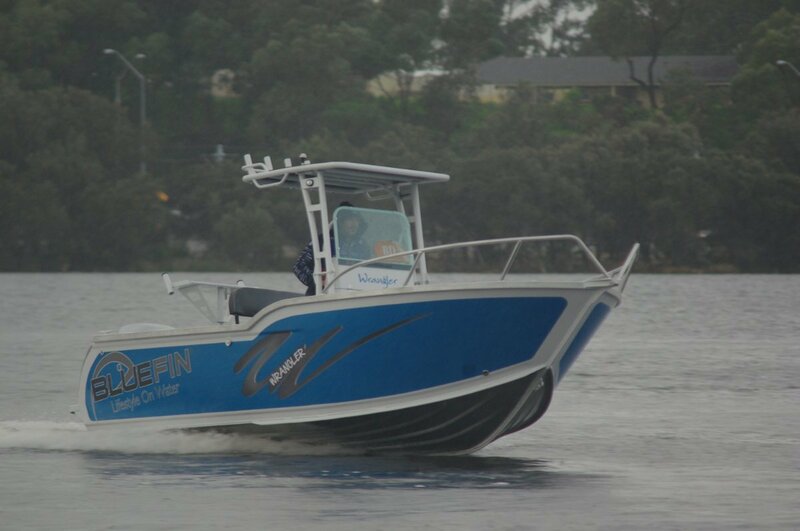 Unusually in a pressed aluminium boat, the Bluefin’s deck is also in aluminium rather than the expected ply. It is disguised by being sheathed in carpet, as are the inner surfaces of the boat’s sides. The latter is not just decorative; it makes progress through the water a touch quieter, and has a very practical use for the fisherman. Instead of fitting racks to carry them, light rods can be hung along the carpet by Velcro loops. Tackle and other odds and ends can also be hung here in plastic bags fitted with Velcro patches. Alternative stowage for rods is provided by five rocket launchers and a pair of sockets in the side decks. Overspill of odds and ends has plenty of room in the side pockets. The rocket launchers are mounted on a particularly massive frame that carries the T-top. This is independent of the console’s windscreen, which hinges forward by undoing a pair of over centre clips. The frame, too, can be hinged down but it needs a spanner on four bolts to be achieved. There is logic here: it could be a life threatening event for anyone up forward if it came down after a couple of simple clips were accidentally released. The Wrangler had an eye catching paint job, but the builder had been to the trouble of masking the rubbing strip before picking up the spray gun. It is actually more than just a strip, rather a deep extrusion capable of absorbing the results of vigorous parking. An extra paint protecting feature is the wear pads on the side decks, guarding against boarders in hard shoes. It seems most Hondas have just three basic gauges, but this one has a button pusher’s delight: a small screen that can display your choice of 20 functions on demand. Even a cupboard Luddite like me can appreciate such information as how long to an empty tank at the current speed. Having just the one screen makes more of the console available for the twin displays dedicated fishos, those with a few dollars to spare anyway, prefer over a single combo sounder and plotter. Our150hp Honda had a high percentage of the suggested maximum power and delivered a vigorous performance. With just two or three on board it would probably still have vigour with quite a lot less horsepower. As is usually the way with generous power it needed the smallest touches of the button to adjust trim, and the Wrangler rewarded getting the trim just so. Driving, standing or sitting, was comfortable and effortless; the hydraulic steering feeling as though it were power assisted. Forward, matching the sides rising towards the bow, is a raised platform with a socket to accept a swivel chair. 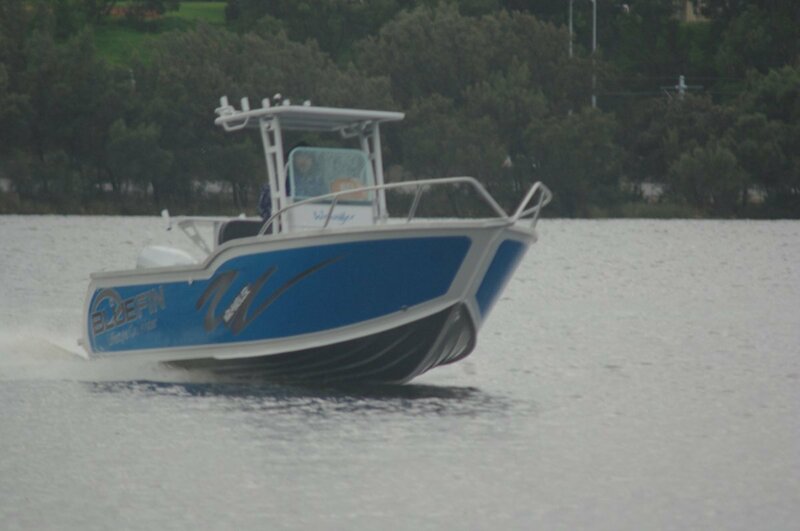 Apart from its fishing convenience, the platform has created a useful quantity of under deck stowage. Distributed around the boat is a surprising total volume of places to put stuff: the console itself, the seat box, the side pockets and transom lockers. 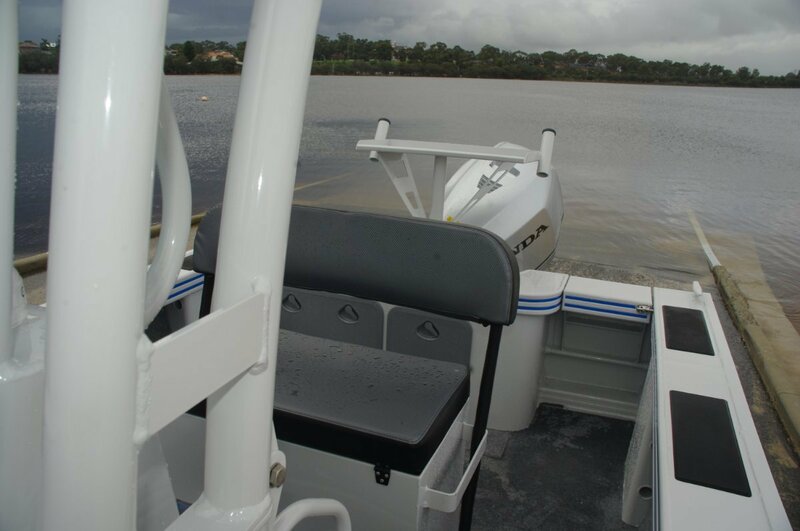 The latters’ capacity is reduced due to the presence of one of boating’s most desirable extras – a second battery. At 6.23 metres this is large as centre consoles go and, with the lack of items taking up deck space – the console and seat box with its reversible back rest are the total – it is very roomy. Extra seating, likely a box type ahead of the console, could be easily installed, but if not really needed it seems a pity to add clutter. Size and hull form give good stability, and the space each side of the console allows easy passage. In contrast to the Spartan interior, the fit out is almost lavish. Removable bait board, plumbed bait tank, deck wash, boarding platforms, ladder and door, and the near compulsory stereo system. A complete package.